First of all, let me thank the people that gave a positive response to I Suspect It Is Here For Me. Although I write primarily for myself and for the enjoyment, it is nice to have my stories read by others. Moreso, it is astonishing to me that people enjoy them and understand what I am trying to say without directly saying it. I am deeply grateful to anyone that reads my work, it will forever be a privilege that will never take for granted. For me, writing a short story is much more enjoyable than writing a longer piece. They are two completely different processes. I have found that to construct a short story, I need 4 things. An event, strong characters that I know well, a setting that works for the story, and a deeper social observation or commentary. Sometimes these develop together in tandem with one another, and sometimes they form separately. For example, I have a folder with 17 character profiles, some of which are very well developed, but I don’t know what their story is. And I have another folder with 12 events, but I don’t have any characters that fit with them. I want all of the stories I share with other people to have a deeper message. It’s an area of my writing that I’ve focussed on a lot over the last 12 months or so. Sometimes it is rather obvious what that message is (as in Creases), and sometimes I want it to be a little more subtle (as in The Applicant). One thing I enjoy as a reader is when a story works on multiple levels, and some of my favourite authors are masters of this style of storytelling. I suppose in a way I am trying to emulate this. It is not my place to judge how successful I am in achieving this, that is for others to say, but I aspire to work at that level. I have a large number of short stories written that will never be shared with anyone else because they lack a deeper message. I have a story called Those Without Faces, which is a story about a man having a psychological breakdown at a train station. It’s got a good plot that works well, but it’s not really saying anything. There’s another story I wrote in early 2018 called My Boy which is about a mother refusing to acknowledge the death of her baby, and she goes for a walk in the park, with the baby’s body in a pram, talking to the body like it is still alive. Both are stories that I wrote before I had decided what their message was, and therefore they aren’t really saying much beyond what is on the surface. They feel rather trivial, and worked well as a writing exercise, but they will never see the light of day. For one of my shorts, In Perpetuum, I had the initial event and setting planned for a while, but I didn’t have a character that worked and I wasn’t sure what message I was trying to give. Then one day, I found myself falling down a rabbit hole of watching vlogs on the youtubes dot com. They are horrendous – stay clear, for your own sanity. But they are interesting as character studies. And then one night my 15 year old guide-daughter casually asked if she had been ‘left on read’. I hadn’t heard the phrase before because I’m 132 years old! I love language and I love seeing it evolve and adapt to include new words and develop new common usage rules as the years tick by. From those three things, Jesse, the MC of In Perpetuum, formed pretty quickly. Once I had her and the event sorted, the deeper message came with relative ease. I really enjoyed writing this story because although it had a stuttering start, once it came together it took on a life of its own. Sometimes I feel like I have to consciously decide on every action and movement, character thought or speech, and actively drive the story towards its end. Then sometimes, a story will gather momentum and write itself. Whilst writing this story, things would happen and I’d be like, ‘Oh wow, ok that’s happening is it? I didn’t see that coming.’ (See, I told you I’m pretentious.) The secondary character turned out very, very, different than I initially intended. That, in turn, helped give the deeper meaning a bit more substance. Overall, I’m pretty happy with how this one turned out. 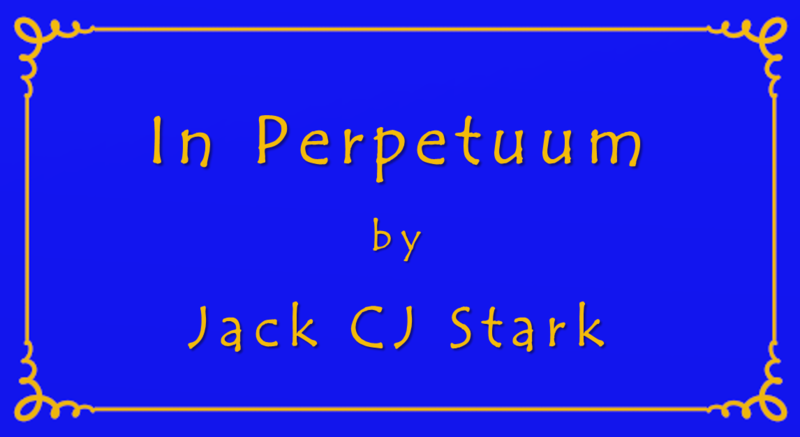 In Perpetuum by Jack CJ Stark. Anyway, I’m off to repeatedly refresh my twitter notifications page until someone finally engages with me. Until next time, Peace and Love! Reading it the second time, with the ‘newness’ gone, it’s even better I think! Well, no I don’t think- I know… there is a whole lot more to the story than at first appears and I think your vlog adventure was a good action for research. You really translated it across… I am still somewat perplexed by the other character though… so conflicting! I think there is a lot of subtlety going on between these characters, and I think there is more to their actions than first appears. The man dressed in black remains to be a mystery to me too. Yes to the subtlety- you said it well! And I have 3 thoughts/ideas formed about who or what the man in black could be… I think if I read the story again, I might well find a 4th option!